S7 Engineering, part of the Russian independent MRO provider Engineering Holding, has completed painting an Airbus A321 operated by Air Astana, at the provider’s dedicated painting facilities in Mineralnye Vody. This is the second time Kazakhstan’s national carrier has trusted the Russian company with aircraft painting job, done under S7 Engineering’s EASA Part 145 approval. In the spring of this year Air Astana’s Boeing 757-200 received a refreshed livery in Mineralnye Vody. The Engineering Holding told Russian Aviation Insider that it was counting on expanding cooperation with Air Astana. Engineering Holding’s sales manager Stanislav Mitin told Russian Aviation Insider that for the A321 with tail number P4-KDB received the renewed logo of the operator, which had been developed within the framework of the recent rebranding. The national ornament surrounding an arrow has lost its silver lining and thus became more modern and articulated, and the font changed. 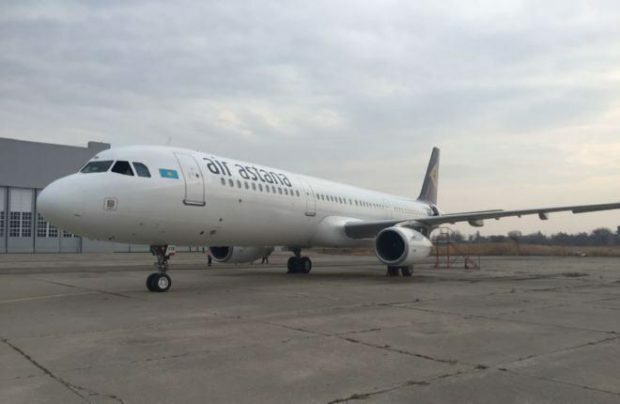 All of Air Astana’s fleet will gradually have to be repainted. The works started in the spring of 2016 and are still underway. Mitin emphasized that all of the plackards and stencils necessary for the job had been produced at Mineralnye Vody facility. After negotiations scheduled for 2017 Air Astana’s cooperation with the Engineering Holding may be significantly expanded and include base maintenance. The Kazakh carrier currently sends its aircraft abroad for heavy checks, as it is unable to do so in Kazakhstan. It has been working with Chinese provider Haeco since 2012, and during this period each of the airline’s aircraft (except Embraer E190) has undergone heavy maintenance in China at least once. “In 2017 we are counting on negotiating the details of our future cooperation with Air Astana, including heavy maintenance of its aircraft in Russia; not just painting. We will probably offer the services of the production facility in Novosibirsk, our Sibir Technic subsidiary, because it makes more sense geographically,” Igor Panshin, Engineering’s deputy director for planning, explained to Russian Aviation Insider.